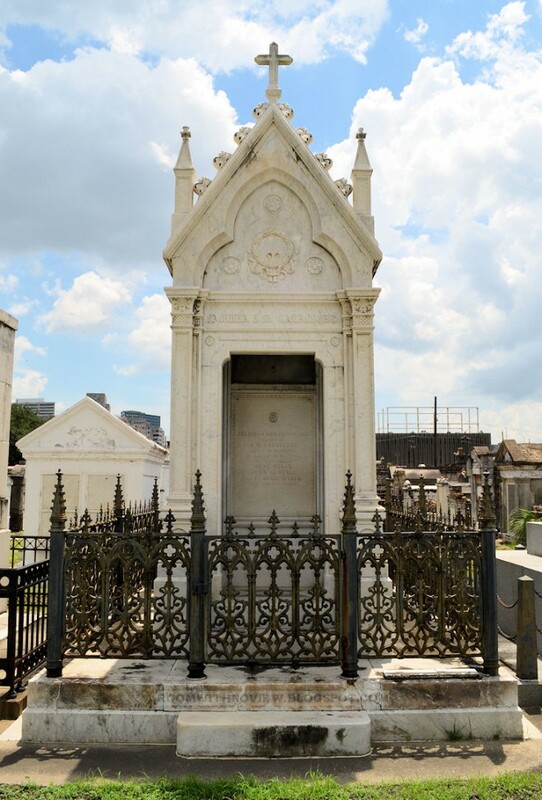 Jacques Nicolas Bussière de Pouilly had a profound impact on New Orleans architecture in the nineteenth century, and some of his most original, innovative contributions are funerary monuments that still stand in the city’s cemeteries today. Born in a small French village, he may have studied at the École des Beaux-Arts in Paris before arriving in New Orleans, Louisiana in 1833. However, his enrollment at the school has thus far not been confirmed. In New Orleans, de Pouilly made significant architectural contributions, such as the St. Louis Exchange Hotel and work on St. Louis Cathedral. Although smaller in scale, some of de Pouilly’s most important and inventive designs were for funerary monuments. In New Orleans, the deceased are interred in tombs above the ground due to the city’s below-sea-level elevation and high water table. Since flooding there can lift caskets from their graves, New Orleans follows the French and Spanish tradition of burying their dead above ground in tombs and vaults, some of the most elaborate of which de Pouilly is responsible for creating. They are laid out in rows along paths, a pattern that resembles a city and gives these cemeteries the nickname “Cities of the Dead.” In his funerary monument designs, de Pouilly was heavily influenced by Père Lachaise Cemetery, the largest cemetery in Paris with which de Pouilly would certainly have been familiar. Ann Merritt Masson writes, “Père La Chaise was the most renowned, most published, and most imitated cemetery of the time, and it must have been especially admired by the large French-speaking population in Louisiana,” making it the perfect example for de Pouilly to follow. His designs also echo the revolutionary new architectural theories of the time that were popular with young students at the École des Beaux-Arts. These students rejected strict, classical principles in favor of a new style that developed into the Néo-Grec. De Pouilly combined these ideas with Classical Revival, Gothic, and Egyptian styles to create imaginative designs for New Orleans funerary monuments. 130 of these designs, dated from 1834 to 1874, are contained in a sketchbook of de Pouilly that is now in the possession of the Historic New Orleans Collection. While some of these plans were apparently never carried out, some of them still stand in the cemeteries of New Orleans where they attest to the creativeness of de Pouilly and the architectural impact that he had on the city of New Orleans. 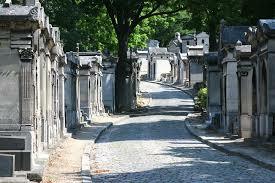 These are photographs of Père Lachaise Cemetery in Paris, France. 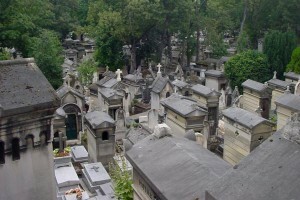 It is also known as the Cimetière de l’Est and was established in the year 1804 as the first metropolitan cemetery of three in the city of Paris. Revival styles of architecture were frequently used for monuments, as they were “versatile and applicable to cemetery designs in form and symbolism.” Classical, Gothic, and Egyptian Revival styles were the most popular, and Père Lachaise profoundly impacted de Pouilly’s own mortuary architecture style and designs. J.N.B. de Pouilly, Alexandre Grailhe tomb, 1850, St. Louis Cemetery Number Two, New Orleans. J.N.B. 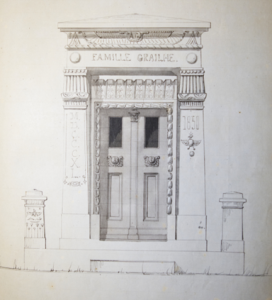 de Pouilly, Design for the Alexandre Grailhe tomb from the J. N. B. de Pouilly Sketchbook No. 13 Bis, 1850 drawing, 13” x 8”, Historic New Orleans Collection. Of de Pouilly’s 130 sketchbook designs, only eight drawings depict the Egyptian Revival style, which suggests that de Pouilly favored classical styles over Egyptian. This tomb is located in St. Louis Cemetery Number Two and was constructed from one of two designs for the Grailhe family in 1850. It is one of the eight sketchbook designs in the Egyptian Revival style. The tomb contains a chapel, and while its massing is like that of de Pouilly’s temple-fronted structures, the columns here are semi-engaged. This creates less of a portico and more of a projection on the façade. The cast-iron fence surrounding the monument contains Egyptian motifs and is not common in New Orleans, and De Pouilly likely created it specially for the Grailhe tomb. While the tomb is Egyptian-inspired, the specific elements are not entirely archaeologically accurate. Egyptian elements on this structure include banded roll moldings surrounding the door, papyrus plant motifs, and several winged discs. J.N.B. de Pouilly, J. M. Caballero tomb, c. 1850, St. Louis Cemetery Number Two, New Orleans. The Gothic style was very popular for mortuary architecture in the 1840s and 1850s, partly due to the appeal of religious association for burial, but the Gothic style was not as widely used by de Pouilly. One of his most significant Gothic monuments is the J.M. 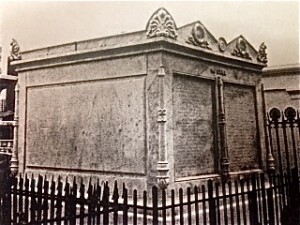 Caballero tomb, which was chosen from three possible designs and built around 1850 in St. Louis Cemetery Number Two. In addition to an emphasis on verticality, the tomb’s Gothic elements include relief work decoration on all sides and a cast iron fence that mirrors ornate tracery characteristic of the Gothic style. As also seen in the fence of the Grailhe tomb, de Pouilly often designed fence patterns to match the style of his funerary monuments. J.N.B. 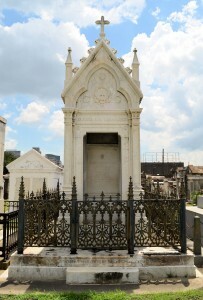 de Pouilly, Peniston-Duplantier Mausoleum, 1842, St. Louis Cemetery Number Two, New Orleans. The Peniston-Duplantier mausoleum is an example of de Pouilly’s classical designs, a style that he and his clients generally preferred to Egyptian and Gothic. 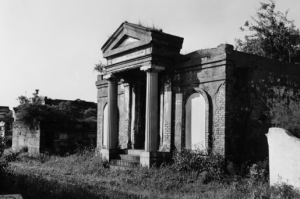 According to Peggy McDowell, this tomb was constructed in the prostyle design, which generally featured “a building with front portico supported by free standing columns.” The columns here are of the Greek Doric order. Another common feature of tombs in Père Lachaise that de Pouilly frequently employs is the iron fence that surrounds the monument. As de Pouilly worked in a variety of styles, he always made sure that the style of the fence matched the style of the monument it enclosed. This can be seen here with the repeated geometrical design of the fence surrounding a Classical revival structure. J.N.B. de Pouilly, Design for the Cazadores Volantes (Iberia Society) tomb from the J.N.B. de Pouilly sketchbook, 1843-5, 13 x 8”, Historic New Orleans Collection. J. N. B. de Pouilly, Society Tomb of the New Lusitanos Benevolent Association, 1859 (now demolished), Girod Street Cemetery, New Orleans. Another society tomb like the Iberia Society tomb already discussed, the Society Tomb of the New Lusitanos Benevolent Association was located in Girod Street Cemetery but has since been demolished when the cemetery was destroyed in 1957. Although several designs for this monument are contained in de Pouilly’s sketchbook, the design eventually chosen is not. The client chose a heavily-pedimented temple front with Greek Doric columns, a popular style during the time period that appears to have been widely in demand among de Pouilly’s patrons. The arched forms originally contained inscribed tablets. This monument is the largest of de Pouilly’s designs that was constructed. This monument represents the less common form of society tomb. Unlike the Iberia Society tomb, the Society Tomb of the New Lusitanos Benevolent Association is a structure that encloses the burial vaults, consisting of a central hallway flanked by vaults on both sides. J.N.B. 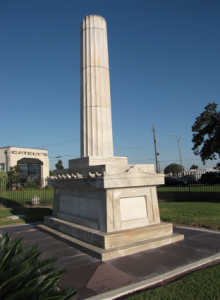 de Pouilly, Monument to Irad Ferry, 1837, Cypress Grove Cemetery, New Orleans. 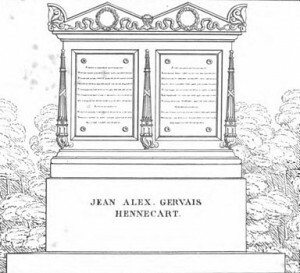 Illustration of Hannecart Tomb from Père Lachaise Cemetery, 1832. J.N.B. de Pouilly, McCall and Jones families’ tomb, 1857, St. Louis Cemetery Number One, New Orleans. 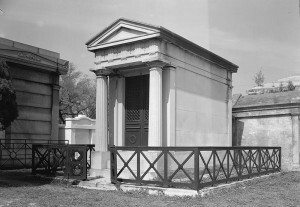 This tomb, which is located in St. Louis Cemetery Number One, is almost an exact copy of the Hannecart tomb in Père Lachaise Cemetery in Paris. This is a great example of the heavy influence Père Lachaise had on de Pouilly’s designs. While most of de Pouilly’s mortuary architecture bears his signature, the McCall and Jones families’ tomb does not. 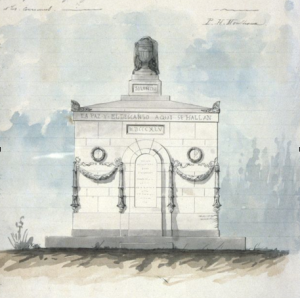 Peggy McDowell suggests that de Pouilly did not officially sign this structure because it was “too eclectic a copy of another’s design.” The design for this monument is not contained in de Pouilly’s sketchbook. The inverted torches located along the front of the tomb are representative of an extinguished life. Working in New Orleans, Louisiana in the nineteenth century, Jacques Nicolas Bussiere de Pouilly created inventive mortuary architecture designs that utilized Classical, Gothic, and Egyptian Revival styles. These structures are located in the “Cities of the Dead” of New Orleans, which are above-ground cemeteries that the city is known for and which are necessitated by New Orleans’s below-sea-level elevation. In addition to the Revival styles, de Pouilly was heavily influenced by his French heritage, often relying on Père Lachaise Cemetery in Paris for inspiration. 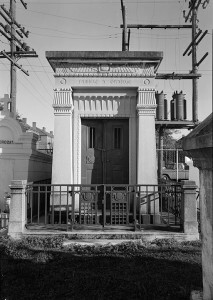 From mausoleums to society tombs to sarcophagus-based tombs, de Pouilly created a wide variety of mortuary architecture that comprised an outstanding contribution to the unique cemeteries of New Orleans. Brock, Eric J. New Orleans Cemeteries. Charleston: Arcadia Publishing, 1999. Didimus, Henry. New Orleans as I Found It. New York: Harper & Brothers, 1845. Florence, Robert, and J. Mason Florence. New Orleans Cemeteries: Life in the Cities of the Dead. New Orleans: Batture Press, 1997. Huber, Leonard, and Peggy McDowell. New Orleans Architecture: The Cemeteries. Gretna, Louisiana: Pelican Publishing Company, Inc., 1974. McDowell, Peggy. “J. 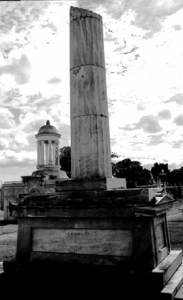 N. B. de Pouilly and French Sources of Revival Style Design in New Orleans Cemetery Architecture.” In Cemeteries and Gravemarkers: Voices of American Culture, edited by Richard E. Meyer, 137-158. Logan, UT: Utah State University Press, 1992. McDowell, Peggy, and Richard E. Meyer. The Revival Styles in American Memorial Art. Bowling Green, Ohio: Bowling Green State University Popular Press, 1994. Masson, Ann Merritt. “The Mortuary Architecture of Jacques Nicolas Bussiere de Pouilly.” Master’s thesis, Tulane University, 1992. Upton, Dell. “The Urban Cemetery and the Urban Community: The Origin of the New Orleans Cemetery.” Perspectives in Vernacular Architecture, vol. 7 (1997): 131-145.